Training from one of the many programs approved by the industry’s watchdog of sorts — Yoga Alliance— offers significant advantages. Your credibility as an instructor is typically based upon where you trained, length of education and well-known yogis with whom you’ve subsequently taken classes. Your business and personal insurance premium rates may be adversely affected without such formal qualifications. Also, banks and other lending institutions may require certification as a necessary professional prerequisite for a business loan as a financing option. Never execute a business venture without a plan in advance. Yoga Journal’s Constance Loizos’s emphasizes this point in her feature “How to Open a Yoga Studio Part 1: Create a Business Plan.” She and Lipper want to bring yogis back down to earth before getting in over their heads. A thriving yoga studio with long-term potential requires more than mats, candles and an ongoing mindful attitude. Mundane expenses, including rent, toilet paper and office supplies, are immediately necessary and quickly add up. You also can’t forget about advertising and marketing strategies. A business credit card by American Express can help fledgling studios pay for and track expenses once studio doors open. Yoga centers around balance. To start a business, you’ll need to achieve this healthy balance the rest of your life. Ironically, your own yoga practice may be deferred under the enormous time constraints of opening a yoga business. Operating a studio entirely on your own can be a 24/7 responsibility, which limits how much you can enjoy the practice on your own. Yoga practice requires concentration on the own body whereas yoga instruction requires astute observation and correction of postures by students. Your own practice will have to be reserved for rare personal time. You may not be able to hit your mat until after your business has solidly established itself in your town and within the industry. With in-depth research, careful consideration, a self-evaluation and relentless passion, a yoga business may just be your future. If all signs point to yes, then follow your dream! 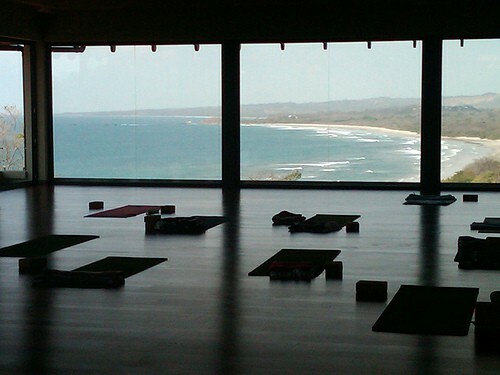 Cover photo of yoga studio from Flickr user Amanda Hirsch / creativedc.